Dr Brendan Ricciardo specialises in arthroscopic and reconstructive surgery of the lower limb and shoulder. He practices as part of a group of dynamic Orthopaedic Surgeon in the Perth area, and also continues to provide a FIFO orthopaedic service to Geraldton. His patients typically range in ages between 40 and 70 who are looking for relief outcomes but do not know Dr Ricciardo, looking for second opinions, and patients who have been suffering discomfort or pain for a while. 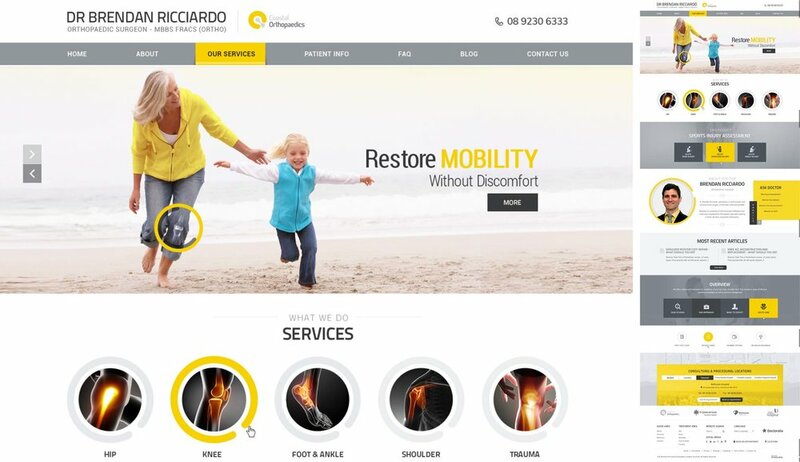 The purpose of the medical website design is to improve his practice’s online visibility, and promote his focused expertise and advanced treatments for hip, knee, shoulder, foot conditions. The website design needs to position the practice as a leader in hip, knee, shoulder, foot surgery and more specifically advanced tools.